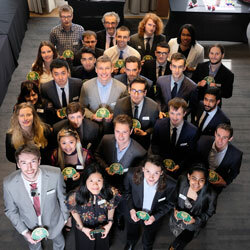 RS Components has put out a final call for entries to EW BrightSparks 2019, an initiative that searches for and highlights the brightest and most talented young engineers in the UK today. Open to nominees based in the UK and aged between 16 and 30, the closing date for this year’s nominations is Thursday, 28th February 2019. Nominations can be submitted via www.electronicsweekly.com/brightsparks/ either by the nominee or a third party. For the third consecutive year, the company is partnering with Electronics Weekly to run the initiative, which as in previous years is not limited to just one winner. It is intended to celebrate a group of young engineers who could already be making a difference in the first years of their working life or may still be in education and showing excellent promise toward becoming the next generation of engineering leaders and innovators of the future.